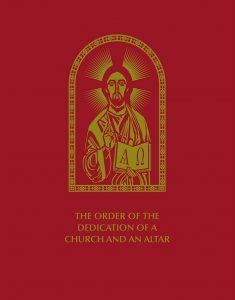 The USCCB’s Committee on Divine Worship has announced the publication and implementation of a new translation of the Order of the Dedication of a Church and an Altar. This revised edition will replace the existing set of dedication rites, which received an ad interim confirmation in 1978. There are no changes to the rituals themselves, although this new edition will now reflect the translation principles in Liturgiam authenticam and contain a large number of musical settings of antiphons and responsories. This text became the required English translation for use in the United States as of November 9 of this year, and the USCCB will be the sole publisher. Copies may be purchased at the USCCB’s online bookstore at $49.95. The Secretariat has also indicated that the Order of Christian Funerals is being reprinted by several liturgical publishers, who are incorporating the newer translations of texts found in the 2011 English Roman Missal, Third Edition. It should be noted that the funeral rites themselves have not changed, the older editions of the 1989 Order of Christian Funerals remain acceptable for liturgical use, and the International Commission on English in the Liturgy (ICEL) does not plan to prepare a new translation of this ritual book in the foreseeable future. Looking ahead, ICEL and the USCCB’s Committee on Divine Worship continue their work of preparing new translations of several other liturgical texts. These include a revision of the Ordination of a Bishop, of Priests, and of Deacons, the Liturgy of the Hours, Second Edition, and the Order of Penance. Several other books are awaiting confirmation from the Holy See at this time: the Order of Baptism of Children, Second Edition, the Order of Blessing the Oils of Catechumens and the Sick and Consecration of Chrism, and a Mass formulary for Saint Kateri Tekakwitha in English and Spanish.